The Insect Trainer’s main character, Guasti Q. Guasti, is convicted of murder after farting so powerfully that a woman falls from her chair, hits the floor and dies. The play is characteristic theatre of the absurd, full of non-sequiturs and jarring stage action. Carey was hard at work rehearsing the play before his passing and created a philosophical tract about the virtues of flatulence. 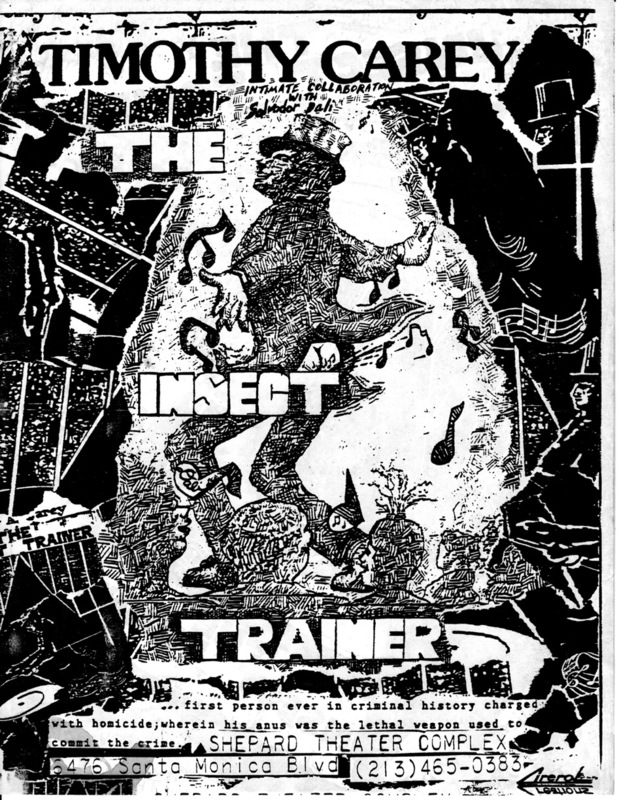 Carey’s son Romeo is planning a revival of The Insect Trainer, due to premiere in Los Angeles this spring. Romeo hopes to take the production on the road. 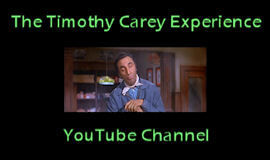 For all of Timothy Carey’s antics, he remained a devoted family man with a wife (only one) and six kids and endless dogs, cats, chickens, and horses. He lived out his life in the quiet suburb of El Monte, preferring the company of his animals to the unearthly world of Hollywood society. As he admits, he “made lots of fast enemies” during his career, but readily forgave his antagonists, as they were often just not ready to appreciate his uniqueness. James B. Harris, the crusty producer/director who had many a run-in with Carey over the years acknowledges, “I know he’s so bizarre and I don’t think it’s gratuitous. I think there is enough humanity in this man. I think he could make a scene better than anyone else.” This humanity described by Harris encompassed a sympathy for the underdog: Carey was a supporter of Palestinian and Native American rights. The romantic equation, the ability to triumph despite the odds, played a great part in his art and his outlook. Finger Man, in particular, is a good example of his early work. Carey plays the right hand goon to mastermind pimp/bootlegger Forrest Tucker. Tucker conveys a cunning and diabolical type; Carey, however, defines a true sociopath, unbridled by gangland criminal codes. He is seen roughing up a woman in one scene, moving her around the set as if she were a small piece of cheap furniture. Later in the film, Frank Lovejoy, the hero, turns on Carey with menacing rancor. Carey reveals himself as the coward we know that all bullies are. This sort of scene is familiar to American film; the difference is, Carey drops the bottom out and operates in the realm of pathos alien to American movies of the ‘50s. America likes a winning quality to its losers. Pounding the pavement of Bay Ridge in hot pursuit of his own myth, Timothy Carey’s youth presaged John Travolta’s Tony Manero (Saturday Night Fever). Carey was born in Bay Ridge, Brooklyn in 1929 to a tightly knit Italian-Irish Catholic family. At age 15, Carey used his brother’s birth certificate to enlist in the Marines. After an unsuccessful tryout for pitcher for the Boston Braves “B” team, Carey became a member of Bay Ridge’s Iron Masters Club, where he devoted much of his free time to weight lifting. 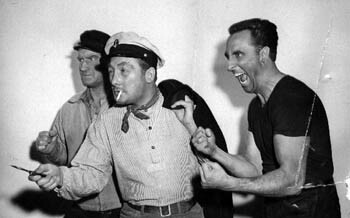 Carey’s interest in body building carried over to his acting career, where he was often used for his physicality. His large, deft frame would spider across the screen and carry a role with little dialogue. Carey expressed his acting “technique” plainly: “If you wanna be a good actor, go to the zoo and watch the rhino – look at the way he moves. Watch the weasel, every part involves a new body pattern.” This focus on the representational ran contrary to the internalized method acting of his peers. Although Carey is often characterized as a Method actor (particularly due to his later association with John Cassavetes), he was, in fact, more likely to throw away the book, appropriate a part, and infuse it with energy. Instigating a new feature here at the blog: the Quote of the Week. Tim imparted a lot of wisdom in his various interviews and writings over the years, so I thought I should share some of them with you. And as Sunday is traditionally a day of rest, reflection and inspiration, I’ve chosen it as the day the quote will appear. May it provide you with much food for thought in the week ahead. This one is relevant to me right now, as I will soon be appearing as an extra in a play for the first time in many years.